“Teach them Correct Principles and they Govern Themselves”. This is the foundation for a sustainable world. This is my message to the world. I was asked to give a talk to the Economics club at Sewanee, the University of the South on our independent local currency initiative, the Sewanee Dollar. But when the sponsor, a student representing the Economics Club read my BLOG, he decided there is more to the story. “I can’t imagine anything sustainable unless founded on true principles, including the freedom to act on them”. That led to a broader discussion of sustainability. Sustainable extends into eternity. It’s not just about restraining ourselves from destroying natural Eco-systems, although that is part of it. It includes spiritual, moral, physical and economic sustainability. It’s about being wise, good stewards. It’s about being the change we want to see. In other words, Saving the World one person at a time. . . starting with me. PS: For a list of some of the community projects referred to in the above video, see my post, Socialism Fails as Free Markets Flourish In the Village. Just getting around to recapping and thanking all those who helped out in Friday’s community project. We successfully framed the carport on our CONEX guest house. Two hours of good fellowship and work followed by delightful conversation over lunch. Everything went smoothly. The timber frame is up, plumb and square. Experience is a great teacher. Still a lot to do before the carport is finished, but we’re well on our way now. The 800 square foot steel roof will provide a platform for solar panel installation and shelter for four vehicles. The combined roof space of carport and guest house is about 1,460 square feet. That more than doubles my effective rainwater catchment area, increasing the margin of water self-sufficiency with our 7,500 gallon Storage tanks. For newbies here, the Village has a rotating voluntary shared project tradition. Every week a different household chooses and organizes a project. The community pitches in to help. One incentive to give time and effort is the expectation of the same when your turn comes around. But, there are others. The opportunity to learn from others with different skills and the comeraderie that goes with good people working productively together toward a common goal are others. Together, we have built a storage shed, raised bed gardens for Several families, temporary shelter for goats, planting, caring for and harvesting produce in the greenhouse, installing drip irrigation systems and many other gardening projects, electric fences and chicken coops worked on our guest house, framed the carport, cooked a pig in the ground Hawaiian style and much more. I want to thank all who have participated so far and invite everyone else to join us. Tradition is Thursday 10 AM start time followed by lunch, but we’re flexible on days and times. Some need to leave to get back to their work after lunch, but there are often several who keep working long after that. All voluntary. Kind of like the famous Amish barn raising tradition without having to be Amish. I was needing to build a guest house. Inexpensive, but strong, well insulated, attractive and off-grid ready. There is a series of YouTube videos featuring Bob Vila building houses with Steel Shipping Containers, sometimes called CONEX boxes. When finished, they make attractive houses, indistinguishable from others in the tract. 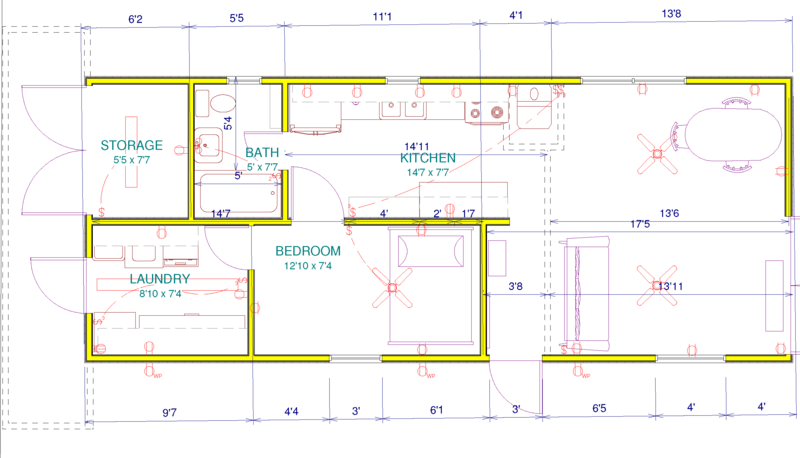 But the cost per square foot is about on par with standard construction at $150 to $200 per square foot. Other than the appeal to save-the-earth recyclers, I have a hard time seeing the point. There has to be a better way. Done, for less than one tenth the cost. A little over a year ago, I bought two CONEX boxes to build a guest house. They cost $2k each, delivered in rural Tennessee from Atlanta. I put them on six steel reinforced concrete piers next to the main house. I purchased good quality used double pane windows and doors from a local salvage place for about three bars of a song. It was handy to already have plenty of dry storage with the containers already in place. The old saying “time is money” turns out applies not only to the cost of labor and capital, but to one’s ability to buy materials at a discount. A dry, secure place to store materials while you take the time necessary to buy frugally and build is an important feature of CONEX boxes that saves lots of money. Over months, that dry storage was put to good use to accumulate inexpensive surplus or used components like sinks, toilets, cabinets, counters, carpet, tile and a wood burning stove from CraigsList, eBay and other local salvage sources. Immediately on delivery, the boxes are dry and secure. But they aren’t insulated and that’s a big deal on a house. Without it, these steel boxes become ice boxes in winter and ovens in summer. We are fortunate to live in an area where Tyson has forced the closure of all the older chicken houses. That’s good in several ways. First, the toxic stench is gone. Second, the neighboring chicken farmers are no longer subject to Tyson’s vassal labor conditions. Third, the chicken houses are slowly being disassembled and sold for scrap metal and the 1 to 2 inch thick foam insulation panels are often discarded. I acquired two kinds of insulation for less than a song (about the chorus of Yankee Doodle Dixie), almost nothing. The spun glass type went over the container tops and under the low-pitch steel roof. Because each container is built to handle the weight of ten or fifteen more containers stacked on it, each loaded with tons of cargo in hurricane force winds on a tossing ocean, there’s no worry about having a higher pitched roof to carry a snow load, especially in mild southern winters. With a plasma cutter, a friend cut holes in the sides of the CONEX for doors and windows and a gaping hole between them to open up a large space for a living area. It was a fairly simple task to frame the holes with standard 2X4’s and install doors and windows. Using standard framing and drywall, it was easy to add interior walls for a storage room, bathroom, bedroom, kitchen, living/dining area and laundry room. Needing more space in the main house, the laundry was immediately moved into the end of one of the CONEX boxes, installing plumbing and electrical in the process. A huge chest freezer was added. In short order, parts of the new house were functional even before it was insulated. The thick marine plywood floors could be easily drilled for plumbing. Used cabinets and the electrical panel (also bought used) were easily mounted to the steel walls in the new laundry room and hooked up by a licensed electrician. Then I installed more vertical studs on the exterior walls, screwing them flat, directly to the steel walls from the inside. The two-inch depth of the studs is perfect to frame the 2 inch thick insulation panels. Next, I ripped some treated deck boards and screwed them horizontally into the vertically oriented studs. I nestled another 1 inch layer of insulation panels between the deck boards and on top of the 2 inch ones. That makes three inches of solid foam insulation on the walls, almost what you would have in a commercial walk-in freezer. With the insulation in place the difference was immediately gratifying. The space, while not yet aesthetically pleasing, was comfortable and livable. People interested in sustainable housing often speak of the relative advantages of insulation vs. thermal mass. With the container house, you get both! By putting the insulation on the outside, tons of steel are on the interior where the mass absorbs, retains and radiates heat or cold from AC, wood burning stove or other heating system. This thermal mass helps keep interior temperatures relatively even. Meanwhile, the insulation on the exterior keeps the extreme temperatures outside. Another benefit of putting the insulation on the outside is that it doesn’t eat up precious interior space. Finally, top off the insulation with exterior siding, and Wa-La, it’s beginning to look pretty nice. Eventually, as time permits, I am thinking of cladding the exterior with cord-wood harvested from the property to give it a rustic feel. A trip to Dalton, Georgia, just across the Tennessee border was well worth it. Dalton is the carpet and flooring capital of America. I found a great deal on commercial quality carpet squares that stay in place without glue or tacking. You can easily replace just the soiled or worn ones. Granite tiles go under the wood stove and vinyl for the kitchen and bath. I love the look of the corrugated steel walls. Granted, they aren’t the smooth drywall look most people are accustomed to, but something a little different is nice. So, keep the variation in the walls. Simply paint them with some lively colors and accent the larger reinforcing members and doors with a contrasting color. It wouldn’t be hard to overlay the steel walls with drywall or paneling, but if you enjoy a different look and like saving the time and money, paint works just fine. I especially like the back-splash wall behind the kitchen sink. 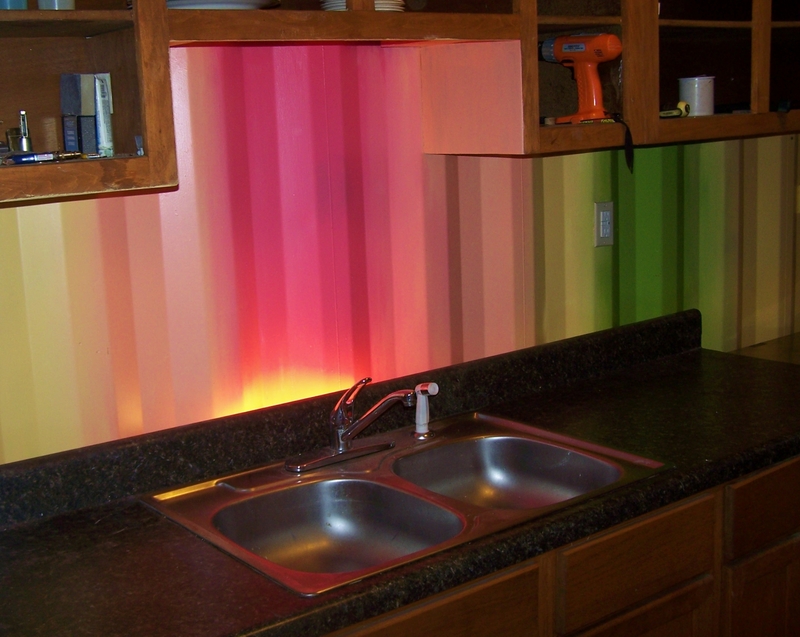 Blending several vibrant colors, you can create a rainbow effect that gives life to the kitchen. The deep corrugation in the steel is perfect for up or down lights that wash the wall and intensify the colors. “Inexpensive”, “innovative” and “attractive”. As you work with these big steel boxes, there are endless outlets for creative innovation to be discovered. Once set on the level, you have already conquered the carpenter’s primary challenge – plumb, level and square. After that, it’s just a matter of hanging stuff on them. Rather than try to make the finished product look and act just like the surrounding cracker-box tract houses, it’s fun to tease out the unique benefits of building with them. From thermal mass/insulation qualities to the unique undulating aesthetics of corrugated walls, to very serious economic benefits, there is a lot to be learned and achieved with steel shipping container construction. This project is only the beginning. The goal is to make this little house sustainable and off-grid with the same kinds of economic savings. Use Solar PV (photo-voltaic), but spend $10k or less to do it. Use hydro-electric from the 50′ waterfall nearby and wind. Integrate and balance these complementary renewable power sources for both the house and transportation. Use the battery pack on a golf cart to flexibly store and supply energy to the house, the cart and portable applications like running an electric chain saw or MIG welder somewhere out on the 750 acres that make up the Village. Folks in the Village on Sewanee Creek are looking for the freedom that intelligent, frugal, debt-free design can afford. We’re experimenting with these and other abundant lifestyle solutions. Thankfully, we share and help one another in our common goals, so I don’t have to do it all myself.